The Boeing RC-135X COBRA EYE was a modfied RC-135S for TELINT missions, carrying a cryogenically cooled infrared sensor subsystem for the Army Space and Strategic Defense Command. Formerlly known as the Optical Aircraft Measurement Program (OAMP), this Ball Aerospace effort was a one-of-a-kind infrared sensor technological development program. The OAMP sensor detected an object's spectra to determine the four dimensions: spatial (location of the object); temporal (temperature of the object); radiometric (brightness in the infrared); and, spectral (color in the infrared). The sensor system's telescope, the first with simultaneous spectral and radiometric measurement capabilities, takes precise, calibrated measurements in three infrared bands. Sponsored by the Massachusetts Institute of Technology/Lincoln Laboratories, the OAMP sensor is a cryogenically cooled system that features an infrared telescope and focal plane assembly. OAMP uses a digital control pointing and tracking gimbal to locate and track objects that emit heat into the atmosphere. About the size of a compact car, the sensor was mounted inside an RC-135 aircraft, the military version of a Boeing 707. Gimbaled mirror systems are used to steer a line of sight for pointing and tracking in optical sensor systems. The system controls the orientation of a tracking mirror which reflects the incoming light from a variable line of sight (LOS) into a fixed input (in position and angle) of a collection of optical sensor equipment referred to as an "optical sensor suite". Common configurations place the fixed sensor suite input along a vertical or horizontal direction. In a mobile platform such as an aircraft, for example, the mirror system may be mounted adjacent to a window of an outer wall of the aircraft. For a traditional gimbaled-mirror tracking system, there is a tradeoff among the following aspects of the system: Field of regard (the angular view range forward, back, up, down) Aperture (beam size) Window size. It is generally desirable for field of regard and aperture to be as large as possible, and for the window size to be as small as possible. The field of regard (FOR) is the total set of look-angles the system can see. A larger FOR gives a more capable and flexible system, with fewer operational constraints. A larger aperture gives a stronger optical signal and greater resolution. A smaller window makes integration of the tracking system simpler and less expensive. In many cases, there are hard constraints on window size. For example, windows may need to fit between structural aircraft ring frames. Some optical materials are not available in large panes. At a minimum, large windows are more expensive, often prohibitively so. Some systems have an uncovered opening or cavity instead of a window, and in such systems the opening should be as small as possible for reasons of aerodynamics. It has been known in the prior art to use a translation stage to move the entire optical system as part of the tracking operation. Such a translation stage may be very large, because the overall optical system will often weight thousands of pounds. It may also be difficult in such a system to coordinate multiple sensor channels, because each must be on a separate translation stage, or their relative motion must be coordinated. One important cause of the above-described tradeoff among field of regard (FOR), aperture size, and window size is that the pivot point for the line of sight in tracking systems is often on the face of a rotating tracking mirror that is necessarily spaced apart from the window. As the look angle changes, the line of sight sweeps in an arc with the fixed pivot point at its apex. At the extremes of the arc, the opaque wall surrounding the window acts to reduce the effective aperture size. While this effect can be reduced by placing the tracking mirror as close to the window as possible, in any practical system there is some minimum spacing imposed by the size and configuration of the mirror supports and other elements of the overall system. The utility of infrared observations for discrimination in ballistic missile defense has been long recognized and appreciated. It was not until 1980, however, that the development of a large-aperture infrared telescope, deployed on a dedicated aircraft with sufficient endurance and operational ceiling to allow sustained observations on ballistic missile systems, where ambient water vapor was low and infrared sky background minimal, was initiated by the U.S. Army Ballistic Missile Defense Advanced Technology Center. Objectives of the Optical Aircraft Measurements Program were development and implementation of an airborne measurement system capable of providing exoatmospheric and early reentry infrared data on BMD targets. This data would be used as a base for development and evaluation of discrimination techniques. In fiscal year 1980, the Army's Ballistic Missile Defense Advanced Technology Center [BMDATC] published an "Optical Aircraft Measurements Program Management Plan" documenting program objectives, the preliminary concept, and the proposed plan of implementation. A determination of the requirements for the aircraft platform and the infrared sensor was under way at the end of 1980. Infrared radiation from the upper atmosphere (above the ceiling of the aircraft platform) was also being measured and modeled to determine its effect on the sensor. Results of these measurements would aid in deconvolution of the atmospheric noise from the target signature measurements. The program began with early sky-noise measurements in 1980. Approximately 80 percent of the planned sky noise measurements were completed by the end of 1980. A site survey assessing available aircraft basing facilities and determining additional requirements was completed and a request made for military construction authority to provide for the additional basing requirements. Several milestones were achieved in the Optical Aircraft Measurements Program in 1982. In the aircraft platform area, a Boeing. 707b aircraft was purchased from American Airlines through an Air Force contract and was delivered to Wright-Patterson Air Force Base, Ohio, in March. In June 1982, the 60-percent design review of the aircraft hangar was conducted satisfactorily. Separate contracts were awarded for the focal plane array development and the sensor integration effort. 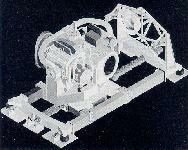 The preliminary design review of the focal plane array was done in September 1982. In August 1982, the Army and the Air Force signed a memorandum of agreement outlining their respective responsibilities and roles in the program. The development of the sensor system and modification of the dedicated aircraft occurred from 1983 to 1989. Lincoln Laboratory assumed the major role of prime contractor for this project, and was given responsibility for development of a three-color infrared sensor under the name of the Optical Aircraft Measurements Program (OAMP). Under contract to the Massachusetts Institute of Technology/Lincoln Laboratories, Ball Aerospace designed and developed the infrared sensor payload, which locates and tracks objects that emit heat in the atmosphere. 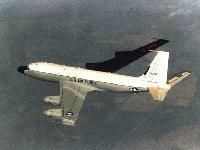 The dedicated aircraft was a C-135, operated and maintained by the Strategic Air Command. The combination of the OAMP sensor and the C-135 aircraft became known as Cobra Eye. Ball Aerospace built the OAMP multi-spectral infrared sensor system to acquire, track, and collect signature data from ballistic missiles and other objects that emit heat into the atmosphere. Providing all aspects of the program - from concept and initial design, to fabrication and installation, and mission support - Ball Aerospace designed OAMP specifically to collect strategic data on Soviet re-entry vehicles and missile launches. The Advanced Technology Center made progress during 1984 in the Optical Aircraft Measurements Program (DAMP), with construction of the OAMP hangar/operations complex proceeding ahead of schedule, the sensor platform modification advancing on schedule, and the sensor-system contractor completing a final sensor design. Ball Aerospace's OAMP sensor technology combined capabilities in unprecedented ways. The OAMP telescope, the first telescope with simultaneous spectral and radiometric measurement capabilities, took precise, calibrated measurements in three infrared bands. About the size of a compact car, the OAMP sensor was mounted inside an RC135 aircraft (a military version of Boeing 707), and collected exceptionally accurate infrared data. Cobra Eye deployed and was based in Alaska and undertook a successful period of data collection from 1989 to 1993. OAMP collected some of the most radiometrically accurate infrared data on key targets of interest that exist to date. The technology introduced in OAMP paved the way for later successes, such as Infrared Astronomical Satellite and multi-band infrared focal planes. E-Systems converted the COBRA EYE RC-135X (62-4128) into another COBRA BALL, initially with only a minimal sensor suite. Configured with windows on both sides of the aircraft, it would support the ballistic missile defense Theater Missile Defense Critical Measurements Program to collect target data.